1. 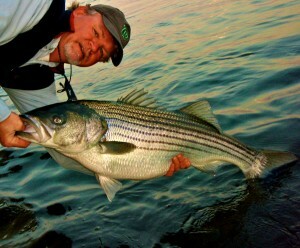 A big striper is best lifted and stabilized by putting one hand under its belly and one hand inside its gill plate. 2. A dry rag can be useful in stabilizing smaller fish while you remove the hooks. 3. The best way to revive a stunned fish is to move it back and forth through the water. 4. The number one reason for mortality in released striped bass is bleeding. 5. 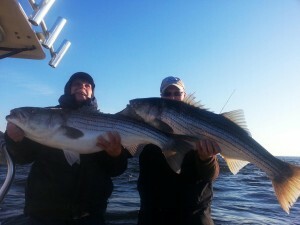 Water temperature is more important than air temperature to the survival of released striped bass. 6. Big fish should be lifted from the water with a mechanical lip-clinching device such as a Boga-grip. 7. To prevent internal damage, all fish should be held horizontally when they are removed from the water. 8. Yellow perch that are caught in deep water should be vented by puncturing the air bladder before they are returned to the water. 9. Landing nets help stabilize fish and prevent injuries. 10. If proper catch & release techniques are practiced, every fish we let go will survive. 1. False – While it is important to hold a big fish horizontally, care should be taken not to touch the gills. Fish gill filaments are very sensitive and can easily be injured. 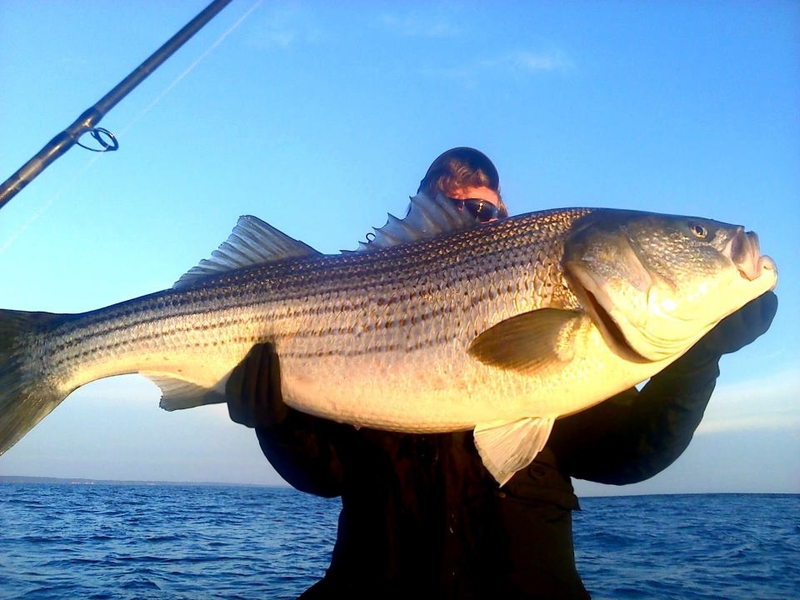 Big stripers should be handled by cradling the fish near the head and tail if possible, or by gently holding the fish near the mid-section. The weight of a large fish is sufficient to tear internal connective tissue. The connective tissue does not grow in nature to resist gravity in a verticle direction. 2. False – A dry rag removes slime and can result in infections once the fish is released. Nothing beats wet hands for handling fish. If you have to wear gloves, make sure they’re rubberized and wet. 3. False – While it is sometimes necessary to revive a stunned fish, it should be moved through the water in a forward direction, either continually toward a strong current, or in a figure-eight beside the boat. 4. False – Bleeding does in fact result in increased mortality, but the number one reason fish die is deep hooking. According to fisheries biologist Rudy Lukacovic, a review of more than 150 C&R studies published in 1994 by Mouneke and Childress indicates that the anatomical location of the hook wound is the single most important factor affecting release mortality with a variety of species. 5. False – While both air and water temperature affect striped bass survival, striped bass research conducted in 1999 showed a profound effect on shallow hooking mortality in relation to air temperature. When air temperatures were below 95 F, the mortality of shallow hooked striped bass (those fish only stressed by physical exertion not by lethal hook wounds) was 0.8%. When air temperatures ranged from 95 to 105 F in July, mortality rose to 17.2%. Catch & release on hot summer days is a bad idea. 6. False – Mechanical devices are great for helping to stabilize a big fish, but a big fish should never be lifted by it’s jaw. If you use a mechanical device, also place one hand under the fishes belly to support its weight like in the picture at the top of this entry. 7. False – The rules are a little different for smaller fish. The best practice is never to remove a fish from the water, but if you have to, it’s better to hold a smaller fish by the mouth so there is less risk of slime removal. 8. False – Venting or fizzing has been shown to help some fish adjust to barotrauma, but internal organs are arranged somewhat differently in yellow perch than in other fish. 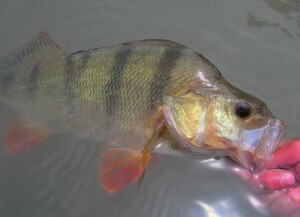 Like their cousins the walleye, the vital organs in perch are highly compacted and very close together. There is a very high likelihood of puncturing other vital organs when fishermen attempt to fizz yellow perch. The best practice is to pull off small fish that are feeding in deep water and look for bigger fish elsewhere. If you do catch a yellow perch with an overextended swim bladder, it’s best to just let it go quickly. You can read more about it in this article on the Careful Catch website: Maryland DNR Biologists Provide Guidance for Releasing Yellow Perch. 9. False – The best practice is not to use a landing net on fish you don’t plan to keep. 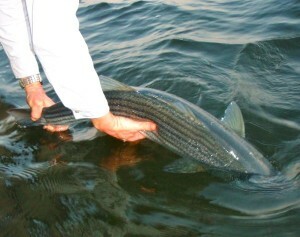 Striped bass are easy to grab by the lip when they are still in the water. That way you can release them boatside or reach down with your other hand and lift them up for a quick picture. If you cant resist using a net, use one that is rubber coated with no knots. 10. False – While employing good catch & release ethics can drastically increase the percentage of fish that survive, studies show that some fish will still die. We catch & release fishermen are kidding ourselves if we think we aren’t killing fish. Fisheries managers include estimates for catch & release mortality in their population studies. The best way to insure you don’t kill fish is to stay home. For some of us, that’s not a viable option. If you’d like to read more about proper catch & release techniques, or browse through some of the science behind the methods, spend some time on the Careful Catch website. It’s a valuable resource for Chesapeake Bay anglers. If you’ve made it this far, then maybe it’s time for a fishing report. It’s been very windy since I returned from vacation, so I haven’t fished in the past week, but I did get out a few times week-before-last and I also received several reports of good fishing last weekend. Most fishermen are working the Bay Bridge, either one of the rock piles or around the deeper pilings. Catch & release fishing has been good there, but not great. Current is essential and smaller lures like 4- or 5-inch soft plastics on 1.5- or 2-ounce jig heads are producing best. I’ve received several reports of schooling fish that are still holding on relatively shallow mid-Bay ledges. That’s pretty amazing for this time of year. Although I haven’t found them myself, my sources are good. There has also been some small fish breaking near the mouths of the rivers. My only guess is that the fish are really confused by the weather extremes we are seeing. I fished with Jamie and Rich a couple of days and we did okay. The fish weren’t easy to catch by any means, but we managed to catch & release a few on 10-inch hotrodded BKDs and 7-inch Bass Assassins. The two fish above weren’t the biggest they caught last Monday morning, but they were a matched pair that came over the rail at the same time. I got this big fish below on a avocado BKD tipped with orange dye on an orange and white jig head. Hopefully the wind will come down soon and we can sneak in some more winter catch & release fishing. Very nice. I missed the one about water temperature vs air temperature, but it makes sense that taking a fish out into extreme heat would over stress it. Also, that’s one heck of a nice fish you have there. I’d be surprised, but I’ve learned better. Very nice indeed. Very interesting opinion on a good/great fisherman.It begged a question and not trying to be controversial, I want to hear what you really think so hear it goes. 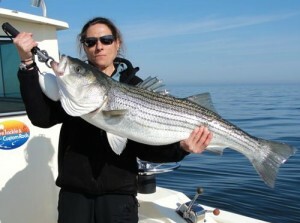 If a fisherman goes out and catches 2 fish (rockfish,his limit) and quits targeting rock how do you feel or cmapare that to a guy light tackle fishing that specifically targets rock and catches and releases 50 or even 100 fish in one outing? Conservation is always a personal decision. I choose to catch & release and use the best practices I know of hoping never to kill a fish (unless I take one home to eat). I’m sure I inevitably do. Remember though, that guy who catches two fish and quits is going to catch undersized or oversized fish as well and may kill more than intended. As I mentioned in the entry above, the best way to avoid killing fish is to stay home. I don’t know any accomplished anglers who would be happy with two fish and out, hence the ethic toward C&R and that’s why I say good fishermen look to release fish. Shawn, thanks for the candid and honest response.I think I hope to be a good fisherman someday:)! I do try to always remain conscsious of respecting the awesome resources we have on the bay and elswhere.One guy that comes to mind is the late Jose Wajebe and you of course.I hate to admit it but I have fished with very few if any good fisherman as defined above.Seems like it is a hard thing to learn, more like something that becomes a part of you because of your upbringing?! I think it’s very reasonable to want to catch more than two fish in a day and not want to kill every fish you catch so good catch and release practices are necessary. I get it that some people have to work very hard for two keepers. That’s why there are charter boats. Since I am from a bass fishing background, catch-and-release is something I do quite naturally without thinking much about it. I do get kidding about the subject at the hunting and fishing club where they say, “Cool Papa may catch & release bass, but when he catches a striper, it’s catch & filet!”. The truth is I catch so few rockfish, I do keep a couple when I can because they’re so good to eat. To (finally) get to the point: It is good that catch-and-release is being practiced and discussed by Chesapeake Bay anglers of all kinds. I only wish it were so the last time there were big bluefish in the upper Bay when almost everyone tossed those 30 inch blues in the dockside dumpster.